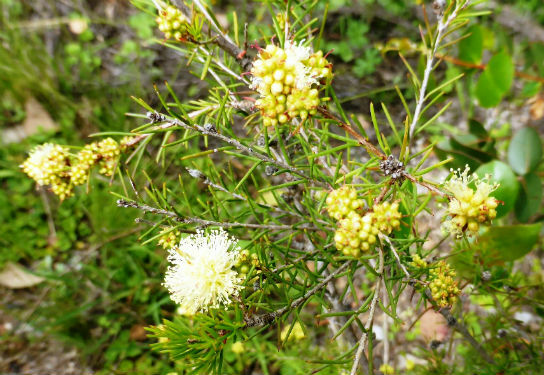 Melaleuca nodosa, Prickly-leaved Paperbark is a medium to tall shrub that may reach a height of 3 metres. Leaves are narrow, rigid and prickly (hence the common name). Flowers are profuse and carried in dense, globular heads. They are deep yellow to white and appear in the leaf axils and at the ends of branches. Flowering begins in October and extends into early summer. M. nodosa is a colourful if rather prickly shrub. It is best not planted near passageways because of the spiky foliage. M. nodosa is found on the east coast of Australia from southern Queensland to the Sydney area, NSW. The species name is from Latin, nodus meaning knobbly and refers to the clusters of fruiting capsules. Propagate from seed. Because of its prickly foliage, preparing cuttings would prove to be a painful experience.